Tarsononemid mites including cyclamen mite and broad mite can cause serious damage to a wide range of greenhouse crops such as New Guinea impatiens, dahlias, gerbera, ivy, lantana, snapdragon, verbena, zinnia, peppers and other vegetable plants. 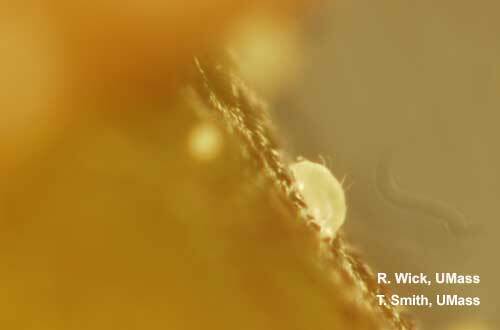 Broad mites inject a toxin from their saliva as they feed. Their feeding causes twisted, hardened and distorted growth in the terminal of the plant and bronzed, rough, lower surfaces. 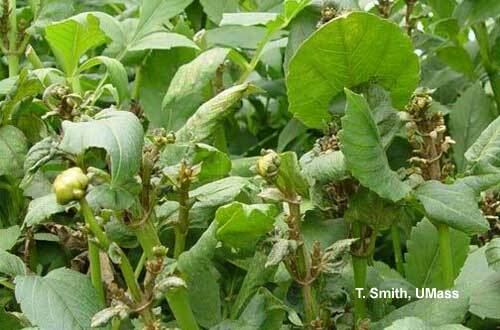 Young terminal buds can be killed and leaves turn downward. Broad and cyclamen mites are too small to see without the aid of a microscope. Regular inspection of crops for their feeding damage is the best way to detect infestations. If characteristic symptoms are seen, send samples to the diagnostic laboratory where they can be inspected under a microscope. 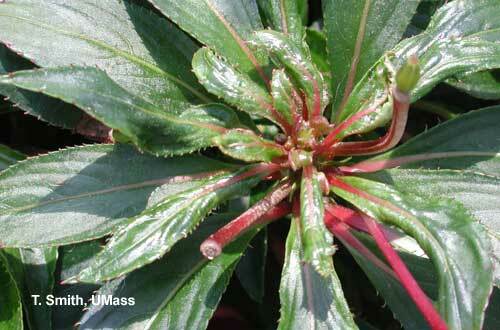 Mites can be easily spread to healthy plants by workers' and infested hanging plants can infest plants below. During scouting and other tasks, enter mite-infested areas last. Clean the greenhouse thoroughly. 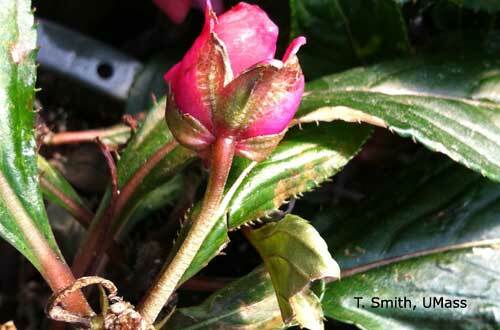 Symptoms caused by cyclamen mites on Delphinium are very characteristic and are sometimes mistaken for disease. Leaves cup or curl and are often blackened. Flower spikes are stunted and blackened. Aconitum, dahlia, chrysanthemum, verbena and viola are also hosts, although they do not exhibit so serious a reaction to the feeding. See Face Sheet: Broad mite and Cyclamen mite: Management in Greenhouses and Nurseries by Raymond A. Cloyd, Kansas State University.